custom made pearl bracelets. With just a few items you can make your own pearl bracelet that looks like the one in store. Cut the elastic based on the measurement of your wrist. Sew the ends by overlapping them. Thread the sewing needle with a thread long enough to go around the elastic with the pearls. Tie the ends of the thread together, so that you are sewing with double threads. Now, put your needle through the hole of the pearl and sew it to the elastic band holding the pearl in place. You can tie a knot at the back of the elastic to make sure it stays in place. I will advise you to do so when you are using large sized pearls but if you are using smaller sized ones then there is no need to tie a knot at the back of the elastic band. Make sure that there are no gaps between the pearls and that the elastic is not seen through. 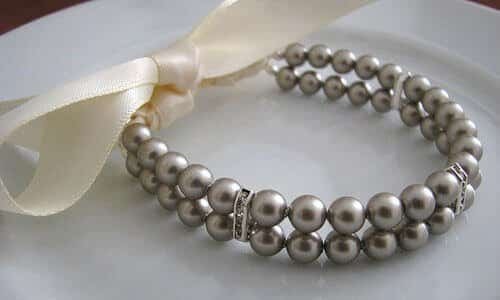 One way to hide the elastic band is to sew smaller sized pearls between the larger ones. and jeans to give the outfit a polished look. It makes a great gift to give to a friend or to your young daughter who wants a big girl bracelet like her mom.